Hi friend! I hope you all had a splendid weekend and enjoyed Katy Perry’s ridiculous half time show as much as I did. I have now decided that whenever I go out I’m going to arrive there either on a golden lion powered by handsome men or on my very own shooting star. Because why not? Anyhoo, across the country it has been feeling super gloomy and doomy and I’ve had just about enough of it. The winter blahs have set in with full force and I’ve decided to drive them out with a bright, fresh, tangy, sweet salad. Some of my favourite flavour combinations include anything with toasted sesame oil, ginger, lime, and garlic and combined with the sweetness of mangos and apples it just makes my heart sing. If you want to make this salad super jazzy and add an extra boost of nutrition, you can try rehydrating a tbsp. or so of wakame and adding it to the mix. Either way, every mouthful will hopefully make you forget about the ton of snow, rain, and/or sleet that’s still pummelling down on you from the heavens. As usual, feel free to get creative and play around with different ingredients or proportions until you find your sweet spot. All recipes are really just a jumping off point for you to get your creative juices flowing! 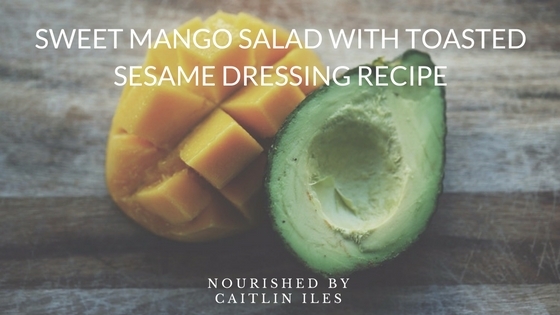 Add mango, cilantro, apple, red onion, carrot, and sesame seeds to a medium salad bowl and mix thoroughly. Top with Toasted Sesame Dressing and green onions. Well friends, that’s my sayonara winter blahs recipe for today. If you’re looking for more ways to beautify yourself from the inside out then make sure you download my FREE Sensational Smoothies Recipe Book by clicking here. I hope you have a fabulous week!